K, my baby, my sweet sweet baby, got attacked by a yak yesterday. Not cool yak, so not cool. To be real though, K is not a ranch dog. 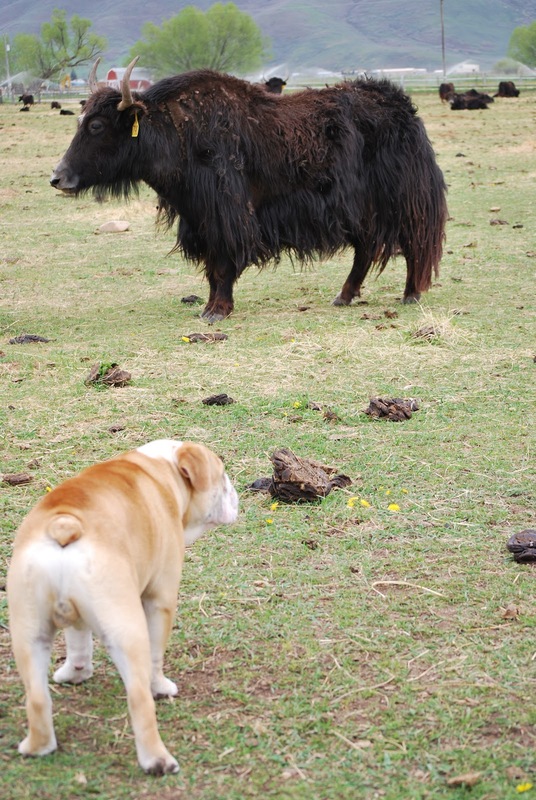 I know he walks and talks the part but he's just not a cow dog (or yak dog in this case). He wandered right up to the strange animal just like they were old friends. Not the smartest idea when said animal is a lot larger than you and has pointy horns, just sayin. He found out soon enough why this was a bad idea. Poor poor baby, he's still recovering. He did make friends with Oliver though. Who is Oliver you ask? He's the newest addition to Haven Springs Yak and an orphan. His mommy died. Sad right? Well, Oliver is being very well taken care of so don't be too sad. He's a happy guy and thinks that Jay, or anyone that feeds him his bottle, is his mommy. what the bangs? someone help that poor girl. He loves A too but kicked K right in the face a few times after this shot. Once again, not the smartest dog. This is Jay, Oliver's real parent. He owns part of the herd, takes care of the yak and lives at the ranch. If you look up "cowboy" in the dictionary you'll see a photo of Jay. Seriously. There has also been a ton of flooding at the GR this last week. We've gone up twice to sandbag. Notice the beautiful row of sandbags in the back. I was there to photograph the event for posterity and to make sure K didn't get swept down the raging river. He would sink like a rock. No joke. In other news I went to my niece's school program last weekend and it was Oscar worthy. and the men went fishing at Green River and had a wonderful time. Kipling + baby yak = serious cuteness. That was adorable! Poor Kipling-I guess ranch life is tough. Looks like you guys are having a blast already and I am seriously excited to come out and see the herd. My kids are in love with this blog. Miles: What!? What is that? Miles: That is a cat? 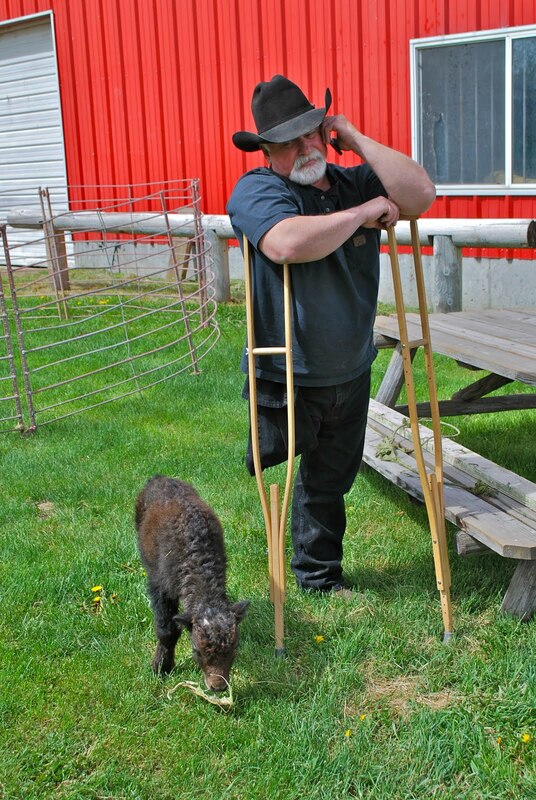 Faye (at Kipling): That's a sheep! Me: No, that's a dog. Faye: I LOVE doggies. But, Miles doesn't love doggies- I love Dodger. I love Dodger. I love Dooooooodddgggeeeerrr. What's doggie''s name? Do you think when you guys get back we could bring Faye over for a playdate with Kip? ps. When are you coming back? I sort of miss you. Jen-I am sooo excited for you to come! Cody will become a legit cowboy out here :) It's going to be a party and maybe by then it will have stopped raining! Cicely-that is wonderful!!! I sort of miss you and your sweet kiddies! Faye, and any of the Cain family for that matter, is welcome at our house anytime. I heard that you're coming out to Utah sometime, will you be in SLC or no? We're headed back in August.